Managing your media on a mobile phone can sometimes be cumbersome – many phones have cameras that make it easy to take photos and record videos on the go, but trying to find and share them afterwards can be a time-consuming process. 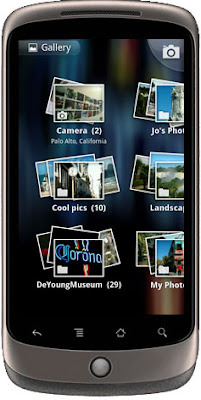 The new Gallery app, which was developed in partnership with Cooliris for the Nexus One, makes it easier to browse, edit, and share photos and videos on the go. For starters, when you take photos or videos with your phone, they'll automatically be available in the Gallery under the "Camera" category, so you can quickly browse photos and videos you've taken or view them in automated slideshows. Since you often want to access photos you have stored in the cloud, the Gallery can also sync with multiple Google accounts so you can view and share all of your Picasa Web Albums photos from the Gallery. Similar to syncing for contacts and email, thumbnails of synced photos are transferred wirelessly, so there's no need to plug your phone into your computer. You can add and select the Google accounts associated with the Picasa photos you want to sync with the Gallery in the "Accounts & sync" tab under Settings. Click on an account and mark the checkbox next to "Sync Picasa Web Albums" to automatically pull your online photos into the Gallery. It works both ways -- you can upload one or multiple photos from the Gallery right to your Picasa Web Albums, Facebook accounts, or other 3rd party applications. Just click "Share", choose Picasa or Facebook, add a caption, select your destination album (or create a new one) and click Upload. With just a few clicks, you can also send photos or videos directly to friends or family via text message, email or bluetooth. For photos taken with your phone, you can perform simple edits like cropping or rotating, and can set any photo as a contact icon or wallpaper. To share or edit photos, simply click "Menu" from any photo to bring up the options. The new Gallery app also makes finding photos really simple. In any album, you can switch between the standard view and grouped view using the toggle at the top right. When you're in grouped view, photos and videos are automatically grouped into digital stacks by date and time, and even by location if geotagging is enabled. 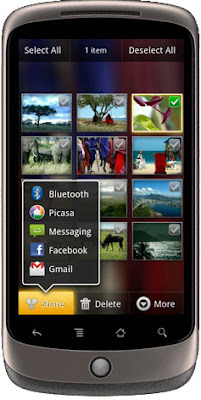 For now, the Gallery is native to the Nexus One, but it will be available in the future for other Android devices with Android 2.1 or later versions.